In Pocone a man recommended us to visit the paradise of Porto Paraiso. Curiously we drove the first 17km on the Transpantaneira and we fully agree, it is a dream. There are some trails into the savannah and to waterholes, which we explored in the early morning and late afternoon. Especially bird life was gorgeous. During the day the swimming pool was a pleasure to cool down from temperatures of 44°C. We spent two days in this paradise and were totally alone. At the second late afternoon we saw a Crocodile under a bush very close to our paradise. Strangely next water was far away. Later the owner of Porto Paraiso told us that the female Crocodiles do their ovulation here to protect their eggs from predators. They are very aggressive during this task. There were also some animals at the farm of Porto Paraiso. Two blue-yellow Macaws built their nest in a drain instead on a tree. Somebody at the ranch closed the drain. On the way to Porto Jofre the heart of the Pantanal and end of the Transpantaneira we saw uncountable Crocodiles dozing in the sun or in the water. 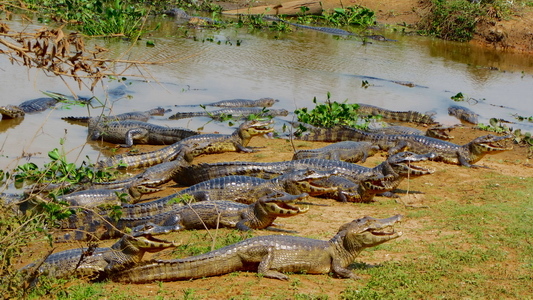 We never had seen so many Crocodiles and for sure will not in the future. But there were other animals too, for instance Capybaras, with up to 70 kg weight and 1 meter length the biggest rodent on earth. There is a noble and expensive hotel in Porto Jofre and a campsite directly on the river Rio Cuiaba. Thanks to the diesel generator for electricity the latter was noisy and smelly in the evening. We missed the paradise and decided to return on the next day. But firstly we strolled a little bit around in the early morning, also in the area of the hotel. But also this paradise has its limitation. Alfred was doing some stuff on the computer at the main house of the farm, approximately 50 meters away from the campsite. It was already dark when a a staff Lady from the ranch came to him and tried to explain him flutteringly something in Brazilian. Finally Alfred understood that Marion was shouting for him. Alfred took the picture above and returned to the main house to show this image. The Lady was scared and not sure if this snake was dangerous; thus she wanted to ask the only available cowboy at this moment, because the owner were in town. But he was taking a shower at this moment. The Lady was putting pressure on him. When he looked at the picture he said noa problema. We three went to Marion, who was watching the door of the bathroom. The cowboy took a big broom and pushed the snake out of the bathroom. But it hid behind a commode in front of the kitchen. Both Ladies were shrieking. Finally he got the snake and drove it out in the wilderness. On the next morning the owner told us that this green snake of approximately 1.5 meters length is not poisonous. The number one attraction in Bom Jardim (GPS coordinates: S14° 33.084' W55° 52.423') is the Recanto Ecologico Lagoa Azul which provides the all the equipment. It includes a nice campground and you start the snorkeling tour to the Enchanted Kingdom - Reino Encantado here with a tractor. Firstly we were 1 hour in a pool with unbelievable many fish of different kinds. Secondly we floated leisurely along the Sad River - Rio Triste. Another beautiful place close to Bom Jardim is the lagoon of the Macaws - Lagoa das Araras. It is a busy place with many birds. We learned quickly that the main attractions in the little mountain area Chapada dos Guimaraes are the waterfalls and pools with pleasant cold water. Temperatures of more than 40°C were definitely too hot for serious mountain climbing or hiking. 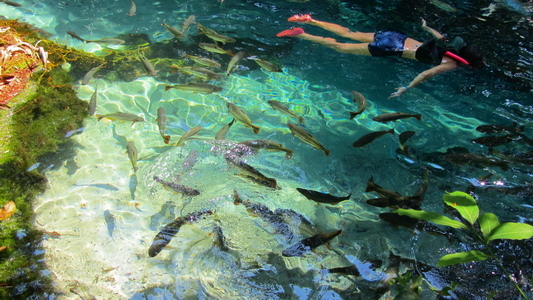 Thanks to the Transpananeia, the heart of the Pantanal is accessible with some efforts. It is a dirt road of more that 100km, starting at the village of Pocone, which lies between Caceres and Cuiaba, the capital of the state Mato Grosso.